Are We Foodies or Snooties? So, I have a question…Since when is good, all natural food reserved for the elite? You don’t believe me? Walk through your local co-op or natural food store with your head on a swivel. Scope out the not so wide array of vehicles in the parking lot, snag your tiny cart, and tell me that you are not being over charged. We shop blindly, content in the feeling of making the right choice for ourselves and family, but what would we eat if we could not afford it? This type of blind shopping is a contributing factor to the growing debate surrounding the foodie as an elitest. What is your modern day foodie? I am guessing they will talk a good game about supporting your local farmer, eating grass fed beef and free range chickens, he will probably have an eco bag in is trunk sporting the “I love veggies” inscription. They will be able to tell you all about gmos and hfcs and bpas, and some may even possess a 650 dollar set of cook book written by Nathan Myhrvold. I will talk on this later down the page) They might even have a blog about the wonderful farm to table spots they’ve been frequenting and how they dropped 300 plus down (wine not included) on a beautifully plated somewhat yummy “snout and trotter” tasting at the newest “nose to tail” eatery. Make no mistake about it, I am all about supporting your farmer, and partaking in yummy foods and yadda yadda yadda. However it seems to me after reading the many blogs and message boards that we are turning our movement into an elite eco system of Chefs and foodies that frown upon those who either 1) CHOOSE to (for whatever reason) factory farmed agriculture. Or 2) just are not ready to jump all the way in. Lets step back and look at the fact that we as a country are so soiled by the industry we are against that we support it even if we don’t want to. So lets relax a little with the harsh comments because we are all guilty. We all support factory farms and unsustainable farming practices be it knowingly or un-knowingly. Most of us grew into our mentalities after living a life of crappy eating. This crappy eating is usually justifiable; a shoe string budget of Ramen noodles while we are broke in college, or just doing what we can to feed our families. That’s my rant and here is my take on the Modernist Cuisine by Nathan Myhrvold… ABSOLUTELY ELITIST! I heard ramblings of this book coming out and at first I was all about it I even think I posted the Wired magazine article on my Facebook page. You know the story of a guy loving to cook since he was a boy, quits his job as a top researcher for a big company and becomes a chef. But 6 BILLS?! First off I must say I am judging the book by its cover. But I am hoping you can give me a pass because it cost 600 bucks! I’m sorry, I’m just not throwing that much coin down. I couldn’t stand paying those prices for books in college, and I surely don’t think its cool to ask middle America to swoop it up at that price. I heard in an interview on NPR him say “you can do these things with regular kitchen equipment you can buy at any old store like Sur le Table and William Sanoma. Seriously!? Normal people don’t shop there. It is this type of pretentious attitude (along with the heafty price tag) that keeps the argument going. I guess what I am trying to say is I understand it is more of a reference and it probably like most other cookbooks, will just sit on a coffee table. But for that price, It better be hand written in gold leaf with a quill from a rare bird found only in Bolivia, published by Gutenberg, taken off the shelf by the Monastery’s librarian holding a candle on a full moon. If you are interested in a a great approach to food science and have lets say 30 bucks, I suggest you pick up On food and Cooking by Harrold Mcgee. If youn don’t have it already. The approach is definitely different from “Modernist Cuisine”. It’s scientific analysis of food, going into the biology and protein chemistry of grains, eggs, meats, etc, and I don’t think that there’s a single recipe in it other than a few historical examples. That being said, it’s a very revealing view of how food behaves chemically, physically, and culinarily, and has helped me understand a lot my screw-ups in the kitchen. It certainly doesn’t compare to a 2500 page, 5 volume set of lavishly illustrated scientific cookbooks. In all fairness, big reference volumes like this do tend to be expensive. For example, the Oxford unabridged dictionary has always been expensive. These things are expensive to produce and the developer should get a fair compensation for what it cost and for how much research went into its production. It is definitely an interesting concept, but totally not for me. Sad because this is the kind of thing that is super interesting but in my opinion totally alienates Middle America. DON’T LET THEM HIJACK OUR MOVEMENT! Fresh wholesome natural food is for everyone. OK. First off I need to say for this little 1 day old dwarf Nigerian fluff ball (that was SO comfy in my arms), I could maybe, even possibly, consider thinking about contemplating, the prospect of becoming a vegetarian. I mean who could slaughter such a cutie? Who thinks “curried goat marinated in kefir and mint” after snuggling up with one of these? This was actually my first ever encounter with a baby goat. I am not sure if I forgot to teach myself while home schooling or if its city living that neglected me the knowledge of baby animal names. In this, case a baby goat is a kid. And this kid has got me thinking about goat milk, and how to make chevre. Elizabeth Wood, of New Leaf CSA offered to teach me, (after a subtle hint), simple but yummy cheeses out of goats milk. And there is no way I would ever sell it at the restaurant. (wink wink). Just as would never make my own cultured butter, creme fraische and quark! People may get sick and DIE from eating handmade unpasteurized cheeses and the like without a thorough inspection from the health inspector. However, I will keep you up to speed on all of my cheese making and milk manipulation REALLY soon! In the mean time, just ask me for recipes and you will get them. I promise. As I’m standing in the cold in awe of new life at New Leaf with Elizabeth and Eesha, I am also thinking veggies. They are not a goat farmers. They have an amazing CSA (community supported agriculture) in Dummerston. The Inn is actually a pick up location for share holders in the Putney area, but for some reason there is only one person with a HALF share picking up from us! What is that about? It obviously has zero to do with the quality of goods offered by Elizabeth Wood. In fact, as of my first ever encounter with these cuddly kids, their shares are seventy-five percent sold. In addition to the Inn these shares can be picked up at the farm (111 dutton Farm road), or at Works Cafe in Brattleboro. You can check out their website for more info as well. Last year I met Elizabeth at a meeting for The Windham Farm and Food Network and thought she was super awesome! It’s ALWAYS great to put a name with a face. I was ordering her yummy carrots last fall through the network (which is super and will totally tell you more about Hanz Estrin and Paul Harlow on another post). I THINK THAT IS 2 PROMISED POSTS! I do have to admit, the only thing I got from Elizabeth last year was some super yummy carrots. I cant even remember how they were prepared. Apologies. This year will be completely different. One of our vegetable options will be dubbed “The New Leaf CSA Plate”. It will be a whimsical preparation of my weekly drop off of assorted vegetables from the farm. So, because I am at this very moment a vegetarian and can’t imagine this cutie going to slaughter, it should be a super inspired CSA Veggie Plate! Definitely check out their site http://newleafcsa.com/membership.html and sign up for their csa which also includes some really cool unlimited pyo (pick your own). I will be re-visiting the farm during the season and will be posting my recipes then. One thing is for sure, by the time I post again The thought of vegetarianism will have passed and I may be blogging of local goat meat on my menu! OH yeah! After doing the whole will you be my friend thing on facebook, Eesha forwarded me these great pics! Thanks a Bunch! 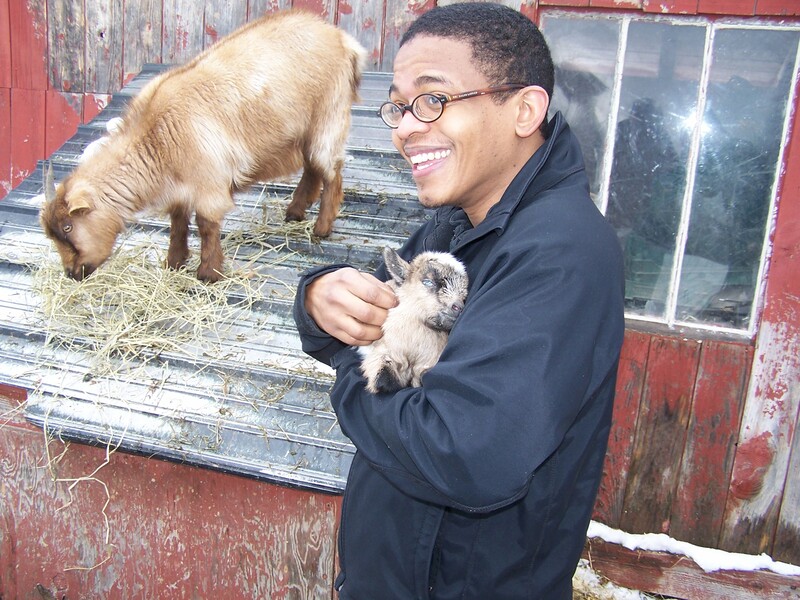 In addition to capturing candid shots of baby goat lovers, he is a contributing journalist for The Valley Post http://valleypost.org/. I have only just recently been introduced to this website and it is welcome addition to my list of informative forward thinking media outlets. CHECK IT OUT! Aging Meat... and its OK to eat veal!